MEXICAN TILE REFINISH : Mexican Tile Renew Project On Longboat Key Fl With Old Time Octagon Saltillo Tiles That Had Been Cleaned With Vinegar Over the Years. Mexican Tile Renew Project On Longboat Key Fl With Old Time Octagon Saltillo Tiles That Had Been Cleaned With Vinegar Over the Years. 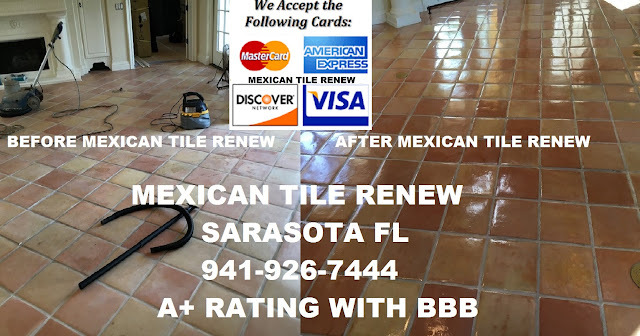 DO NOT USE VINEGAR TO CLEAN YOUR MEXICAN TILE FLOORS: Mexican Tile Renew Project On Longboat Key Fl With Old Time Octagon Saltillo Tiles That Had Been Cleaned With Vinegar Over the Years. Vinegar is an acid and will eat away at the finish on Mexican tile floors. Never use vinegar to clean a Mexican Tile Floor, vinegar is an acid and will pit and destroy the finish on your Mexican Tile Floor. Labels: Mexican Tile Renew Project On Longboat Key Fl With Old Time Octagon Saltillo Tiles That Had Been Cleaned With Vinegar Over the Years.